Harmony - the new standard in audio connections from KLEI. Keith Louis Eichmann re-invented the ubiquitous RCA plug 15 years ago with his little Bullet Plug. Outside of the pure silver version that quickly followed, it's never been improved upon - copied, imitated and even forged, but never bettered. Until now. We could ask, what took you so long? It's not easy to improve on something that seems so blindingly simple and elegant, so if you want real improvement, then it's going to take some serious thought and if you are the one that designed the original, the ability to stand back and look critically at what you have done and how it can be refined in meaningful ways. The original Bullet plug uses an earth pin, rather than encircle the centre conductor pin with a formed metal collar as with all other RCA plugs. KL's Harmony design features a redesigned single point ground connection, which has an optimized shape, mass and thickness of the conductive elements. 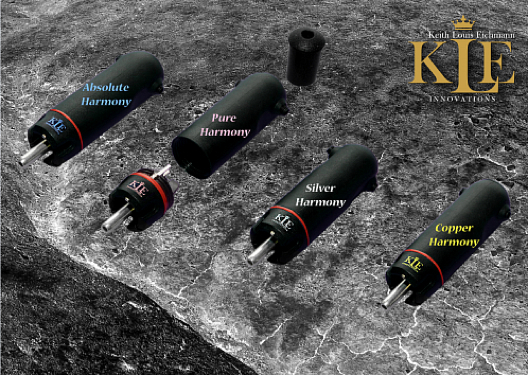 Learning from the fact that the Silver Bullet plugs far outperformed the original gold plated versions KL has incorporated increasing silver content in the 4 new Harmony Plug designs. The entry level Copper Harmony appears to be silver but the two conductors are in fact plated. But the base material is high purity copper, whereas the original bullet plugs used Tellurium Copper which is significantly less conductive - and the gold plating dropped this further. How great are the differences in conductivity in metals commonly used in connecting plugs? This is hugely important as any sound in an audio system comes from the movement of electrons - that's what electricity is - and anything that gets in the way is bad news. Pure Copper is regarded as being the standard for conductivity and has an arbitrary 100% value. And all that gold you see on audio plugs and sockets? - 65-75% - see a problem? The brass that hides underneath the gold plate almost all other plugs is at best 28%. By way of comparison Pure Silver comes in at 105% - it's a better conductor than even the most pure copper. Even if you just see that these new plugs are less of a barrier to music then you'll be well on the way to understanding how and why they work. Further refinements to the body of the plug, much easier to solder connections and better separation make the new Copper Harmony plugs actually sound better than the original Silver Bullets - for less than half the price. The Silver Harmony Plugs move to a pure silver earth conductor while maintaining the silver plated copper positive. And the Pure Harmony plug is all high purity silver. The Absolute Harmony plug is simply as good as it gets. Because of the improvements made to the physical designs, not only is the Copper Harmony Plug better than the original Silver Bullet, the difference between the Copper Harmony and every successive model is more obvious and worthwhile than that in the originals. All these plugs are now much easier to fit and use - everything is more solid and tactile, soldering is much simpler and the better positioning and profile of the solder tags means even a novice enthusiast is going to make a good job with them. So who is likely to use these plugs? Our first experience of the early Bullet Plugs was a pair fitted to our turntable - the improvement this made was remarkable, so it follows that anyone with turntable should get in with a pair as quickly as they can. Likewise for anyone with any of the braided Kimber Interconnects - Tonik, PBJ, Silver streak and Ag - the construction of these makes fitting any of the new Harmony plugs a breeze - given that Kimber themselves have better plugs options on most of their cables, that's a clear indication that better plugs are worthwhile. The vast majority of interconnect cables out there will be greatly improved by the addition of the new Harmony Plugs - we've got high quality silver solder we’ll also supply if needed - and if needs be, can even fit them for you for a reasonable charge. If you are into making your own cables, the new Harmony plugs have to be at the top of the list - the Copper Harmony plugs are completely affordable when compared to any other specialty RCA . If you are aiming to create something special, the better versions will thrill. Who knows where this playing around with cables might lead - you could be the next Keith Eichmann. Whatever originally started KL on his path, he's come a very long way and the plugs are only an introduction - if you really want to hear what is possible with these plugs, you have to check out his new gZero interconnect cables - they are designed around the same principles as the plugs and then take things further - the better the cable, the better the plugs employed. 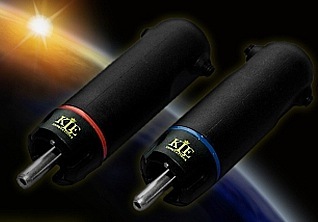 The new KLEI Harmony plugs come in standard packs of 4. We've got all the models in stock now. Do let us know if you have a big project in mind - such as doing all the plugs in a home theatre system as we can come to the party for greater numbers of plugs. KLEI Copper Harmony Plugs - pack of 4 NZ$100 including GST and delivery.